Apple tart is a traditional French dessert, made with a flaky butter crust and an apple filling using apple puree/sauce and fresh apples. Usually cinnamon is not used in a French apple tart, but if you really love it you can add about 1/2 tsp to the filling. You can also add some chopped walnuts or pecans to the filling as well, about 1/3 cup should do. Generously butter (softened butter works best) a regular, muffin/cupcake pan. Place pan in fridge. In a small bowl whisk the egg and water together until completely combined, place in the fridge. In a large bowl combine the flour, salt, and sugar. Mix just to get them combined, then add in your cold, finely cubed butter. Rub the mixture with your hands or a pastry cutter until you get a rough sandy texture, if there are a few larger lumps (pea-sized pieces) of butter that is fine. Add in your egg-water mixture, mix with a fork or spatula until a rough ball of dough comes together. Then place the dough on a clean surface and shape into a disc. If you feel that your dough is too soft to roll out at this point then wrap it in clingfilm and chill for about 1 hour. Lightly flour your wok surface and begin rolling your dough out with a rolling pin, until it is about 1/3 of an inch (about 4/5 of a cm) in thickness. The shape of the dough doesn’t matter because you will be cutting it out. Take a 4.3 inch (11cm) round cookie cutter and cut out as many circles as you can. I re-roll the dough one more time and I usually get about 11 circles in the end. Gently place each circle inside a cavity of the muffin pan and gently press the bottom and sides. Chill the pan in the fridge for at least 2 hours or covered with clingfilm up to overnight. Preheat oven to 350ºF (180ºC) without the fan/ventilator switched on. 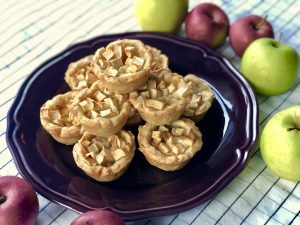 In a large bowl combine all of the filling ingredients besides the apple puree and butter, mix with a spoon until the apples are well coated with the rest of the ingredients. Spread about 1 tbsp of apple puree on the base of each pastry shell. Spoon about 2 tbsp of the apple filling into each pastry shell. Top each tart with a dab of butter. Bake fore 40-45 minutes or until the edges of the pastry are golden-brown. Allow for the tarts to cool in the oven for at least 20 minutes, then remove and enjoy slightly warm or at room temperature. These are best enjoyed on the same day as baking, but you can store these in an airtight container at room temperature for up to 2 days. If you have a food processor, you can make the dough in there. Just pulse the dry ingredients first, then pulse in the cubed butter, and finally add in the egg-water mixture and pulse until the dough begins to clump together.